Southwest Florida has amazingly diverse wildlife, and this month we’re going to showcase a few of a Florida’s most captivating animals! Considering that our Dolphin Watching cruises are some of the most popular cruises we offer – dolphins seemed to be a great place to start! So what makes dolphins so cool? Some of the most social and intelligent creatures in the world, dolphins are marine mammals that are very closely related to whales and porpoises. They live all over the world, but mostly in shallower seas around the continental shelves. Many species can survive in fresh and salt water, which is how they can survive in the the Gulf of Mexico as well as our inland estuaries. Dolphins live on a purely carnivorous diet, such as fish and squid, and most species have between 100 and 200 teeth. Interaction with Humans. It’s amazing seeing people’s reactions, especially in children, when they see dolphins swim behind or along side the Double Sunshine! 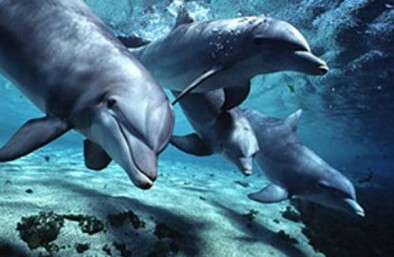 Bottlenose Dolphins are naturally playful and curious animals, and the often will swim along side boats. We have seen them countless times on our cruises, and it’s clear they enjoy our company too! The bottle-nose dolphin can live up to 25 years, with a maximum age of around 40 years old. Dolphins can swim at speeds of up to 24 miles per hour! They can swim comfortably at about 4 miles per hour, which would be a medium jogging pace for their human friends. If they can find adequate food, dolphins can easily swim up to 80 miles per day! Bottlenose dolphins can eat between 15-30 pounds of fish every day. Dolphins sleep with half of their brain at a time. Unlike humans, dolphins are “conscious breathing” animals. This means they don’t breathe automatically – so half of the brain has to remain awake for them to breathe at all times. 20 hz to 20 khz (20,000 hz) dolphins can hear sounds up to 150 khz! They can even produce sounds that we cannot hear with our ears. Killer whales, also know as Orca, are actually a species of oceanic dolphin family. They are referred to as whales only because of their size. You won’t see any of these in the Gordon River, though! If you’re in Southwest Florida, and you want a good chance at seeing some of these amazing animals, stop by and book a cruise on the Double Sunshine. We can’t promise that you’ll see them every time, but it’s very likely that you will! Our dolphin watching tour also features other wildlife that we’ll blog about later this month, as well as some beautiful scenery on the Gordon River! For more information visit PureNaples.com or give us a call at 239.263.4949.